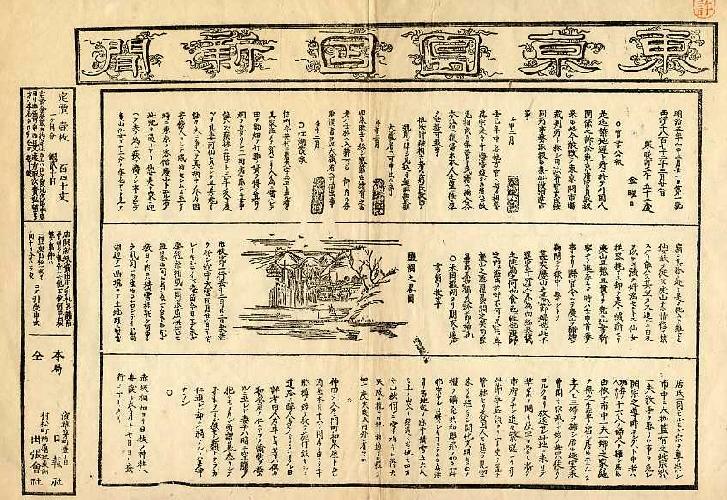 The centerpiece of the single-page inaugural edition of Tokyo nichinichi shinbun -- shown to the right -- is a picture captioned "Sketch of indigo lake" (藍湖之畧圖). The drawing illustrates a story called "Extract of letter: Sent by friend from Salt Lake in America". The names of the sender and recipient -- if other than the writer -- are not disclosed. And the article is not signed -- but we can surmise that the writer is Jono Denpei, and that he received the letter from a friend who probably knew that Jono, Nishida, Yoshiiku, and Hirooka were launching the paper. The dates and events in the article point directly to a delegate with the Iwakura Embassy, which was barely two months into its nearly itinerary are summarized in the following of the Iwakura Embassy which traveled around the world from December 1871 to September 1873. , and the identities of Tonichi's founders and the circumstances under which they produced its earliest issues, suggest that Jono Denpei wrote the article, based on a lettere he had recieved from his friend Fukuchi Gen'ichiro -- a member of the Iwakura Embassy that was then traveling across the United States founding and production, point to of the sender is not disclosed. The name of the recipientthe writer of the article, are not are not diclosed, and the The Salt Lake City report was probably written by Jono Denpei. The letter was probably from his good friend Fukuchi Gen'ichiro, who with Jono's help had published Koko shinbun in 1868. Fukuchi joined Tonichi and became its chief editor in 1874. At the time, though, he was a member of the Iwakura Embassy (岩倉使節団 Iwakura shisetsudan) -- a mission, or delgation, headed by Iwanami Tomomi (岩倉具視 1825-1883). The story begins with the the departure from San Francisco (桑港) on the 22nd day of the 12th month of the previous year [Meiji 4-12-22 == 20 January 1872] and the arrival in Salt Lake City (ソールトレイキシテイ) on the 26th of the same month [24 January 1872], after encountering heavy snow enroute. The writer observes that a certain religious man named Young (ヨング) has 16 wives, that no family in the city consists of only one husband and one wife, that the propritor of the hotel where they stayed has three wives. The letter returns to the snow encountered enroute, and describes the snowpack and cold in the mountains, which appear to be the Sierras. This was not yet three years after 10 May 1869, when Chinese track gangs met their Irish counterparts at Promontory Summit near Salt Lake City, to complete the Transcontinental Railway between Sacramento and Omaha. The writer would have boarded the train at Oakland after crossing San Francisco bay by ferry. After passing through Sacramento and Rosesville, the train began its slow climb through several towns in the foothills of the Sierras, then traversed Emigrant Gap and crossed the summit at Donner Pass, which had slowed and defeated many westward-bound wagon trains in winter, continued east through Truckee, and skirted the northern shore of Lake Tahoe as it passed from California into Nevada, before crossing the desert to a shrunken Utah Territory -- still a quarter century from statehood -- all that was left of what Mormons had hoped would a huge called called Deseret. The territory was still a stage for skirmishes between invading settlers and indigenous Indians. The only Orientals in the area were Chinese laborers who had stayed to work on track gangs. The dates and settings of the Salt Lake City story are significant clues as who wrote the the letter to whom. The day the mission left Yokohama, Japan had 306 polities -- 1 commission (使 shi), 3 urban prefectures (府 fu), and 302 prefectures (県 ken). The following day, Japan's polity map began to undergo major surgery. By the time the mission had completed half its crossing, Japan had only 76 polities -- The Development Mission (開拓使 Kaitakushi) in Hokkaido, the urban prefectures of Tokyo, Kyoto, and Osaka, and 72 other prefectures. The Iwakura Embassy consisted of 46 delegates, 18 attending staff, and 43 students. Many of the delegates, while representing Japan, hailed from the western provinces which had toppled the Tokugawa shogunate in Edo, launched a new government seated in the Tokyo ("eastern capital") as Edo was renamed, and set out to nationalize what had been a lose confederation of local domains. The mission Yokohama on Meiji 4-11-12 (23 December 1871) and arrived in San Francisco on Meiji 4-12-6 (15 January 1872). The mission trained east to Washington, D.C., and crossed the Atlantic to London. From there the mission broke up into contingents that visited a dozen countries in Europe and the Mediterranian, and returned to Japan via several Southeast Asian and Chinese ports. According to one account, 107 members stepped off the train at Salt Lake City. Heavy snow forced them to stay two weeks -- longer at any single locality in the United States other than Washington, D.C. A decade later, the first in a continuing flow of immigrants from Japan arrived in the city. Most found work in rialroad gangs, but in time many immigrants started farms and buisnesses. By the turn of the century, the Mormon Church was dispatching missionaries to Japan. The mission finally arrived in Washington, D.C. on 29 February 1972 (Meiji 5-1-21). The mission was in the United States from mid-January 1872 to early August 1872. The main delegation returned to Yokohama on 13 September 1873. The itinerary of the Iwakura Embassy, covering the times and localities of interest here, is summarized in the following talbe. Dates related to the Iwakura mission are based on the following source. Other dates are based on other sources. The embassy arrives in London on 17 August 1872. By mid December it is in Paris. Japan officially adopts the solar calendar from 1 January 1873. The embassy remains in France until mid February. From France the embassy travels to Belgium, Holland, Germany, Russia, Denmark, Sweden, Germany, Italy, Austria, Switzerland, and France. In July it starts back to Japan via the Mediterranian, the Suez Canal (which had opened in 1869), the Arabian Sea, Ceylon, the Bay of Bengal, the Straits of Malacca and Singapore (not landing because of a colera outbreak), then Saigon, Hong Kong, and Singapore. The embassy leaves Singapore on 5 September, arrives in Nagasaki on the 6th, leaves on the 7th and arrives in Kobe on the 9th, leaves on the 11th and arrives in Yokoyama on the 13th. On the following day, the delgation, led by Iwakura, reports to the Seiin (正院), the executive office of the Meiji government. Kume Kunitake (1839-1931), a Saga domain retainer, accompanied the Iwakura Embassy as Ikawkura's personal secretary. In 1878 he compiled and published a five volume report of the mission, which dubs in English as "A true account of the American and European travels and observations of the extraordinary and plenipotentiary mission" (see Sources). Harue Tsutsumi has written a tight, lucid, informative, no-postmodernist-nonsense account of an 1879 kabuki production of the Iwakura mission story -- in which she argues as follows (Tsutsumi 2007, page 222, bracket hers; see full citation in Sources). From 1871 until 1873, Iwakura's delegation toured the United States and Europe during which they learned much about western civilization including opera, theater and other arts. Eight years later, Hyōryūki kitan-Seiyō kabuki [The Wanderer's Strange Story: a Western Kabuki], a kakbuki play written by kawatake Mokuami (1816-1893) and produced by Morita Kan'ya XII (1846-1897), the most progressive theater manager in the Meiji period, describes the progress of a group of Japanese visiting the United States and Europe. A clear parallel can be discerned beween the actual journey of the diplomats and politicians and the adventurous expedition portrayed in the fictional drama. it is very likely that the person responsible for the strong resemblance between the two journeys was Fukuchi Ōchi (1841-1906), one of the "first secretaries" of the embassy who became a prominent journalist in 1874, also known as an "advisor" for Kan'ya and Mokuami. I argue that this particular kabuki production reflects not only Ōchi's personal experiences abroad as a member of the Iwakura Embassy, but also his practical proposals, as a journalist, on how to westernize Japan. Harue Tsutsumi (堤春恵 Tsutsumi Harue) won the 44th Yomiuri Prize for Literature for a drama she wrote and produced called "Kanadehon Hamlet" (仮名手本ハムレット Kanadehon Hamuretto, 文藝春秋 Bungei Shunjū 1993, 195 pages, limited edition). The play is about Morita Kan'ya (XII, 1846-1897), one of the principle actors and promoters of kabuki during the Meiji period, and his dream of producing a kabuki version of Hamlet. Tsutsumi later became a student at the East Asian Languages Center of India University, where in 2004 she completed a doctoral dissertation called "Kabuki encounters the West: Morita Kan'ya's Shintomi-za productions, 1878-1879" (xii, 316 pages, Ann Arbor, MI, UMI, 2005). The kabukiization of the Iwakura mission has become Tsutsumi's standard story. In May 2006 she presented a talk at a meeting of the Japanese Society for Theatre Research called "The 'natives (indigenous people of America)' of Shintomiza" (新富座の "土人 (アメリカ原住民)" Shintomiza no 'dojin (Amerika genjūmin)'). Speical issue on "Travel in Japanese Representational Culture: Its Past, Present, and Future"